You don't have to dance like the professionals in order to enjoy the Armenian experience. If you attend a party in Armenia (and it is very likely you will), you will experience the Armenian dance - an elegant mix of movements that can at once resemble the Dance of the Veils or the Sabre Dance. Like many cultural phenomena here, it has a history. Ancient Armenian dances and songs were closely related with their everyday needs. They were singing so that oxen could draw the yoke quicker, they were dancing in front of them so that they could have a rest, they were throwing their hands up asking the rain to fall down on them. Modern Armenian dance is also a reflection of its time period. The traditional dance is mixed with numerous innovations of Western and Eastern dances. Armenians have several accepted types of dance: kochari, round dance and solo dance. Women raise their hands upward and twist them in time with music and rhythm. They keep their hands a little bent down at wrists with middle fingers bent inward. Armenian men don't twist their hands but just throw them up and encourage dancers with loud cries. According to ethnographer Arusiak Sahakyan, in earlier times a traditional Armenian woman never danced with her face open and never raised her hands higher than her ears. But in the 21st century, Armenian women are even doing the belly dance, with all its jingling risqué costume and seduction. Armenian dance is distinct by its vitality, and it used to be that every region or even every village had its own unique dance. Round dance is the most popular in Armenia and is a brief review of Armenian history. "We have always been surrounded by enemies and we are dancing shoulder to shoulder as we used to fight and protect our lands shoulder to shoulder, hand in hand," says honored worker of dance art Vanush Khanamiryan. Round dances were formed from as many dancers as people wished. Holding little fingers, with elbows bent and forced together or with hands simply dropped down, a dancers' chain was always moving to the right with rhythmic movements of the feet. There were also round dances with a couple dancing in the middle of the circle. During wedding parties the engaged couple used to dance in the middle of the dancing circle. Round dance had one other meaning. According to tradition, the leader of the dance, who headed the dancing chain, was transfusing the strength of his hands and arms, his happiness and grief, to other dancers. And every time when in the community someone reached a success then he headed the chain, and during the hand-in-hand dance was transfusing his success to others. It is all about movement. And some of the movements have meaning. Up to now Armenian dances have been accompanied by Armenian zurna (wind instrument), accompaniments of dhol (drum), often by the accompaniments of tar, saz, kanon (string instrument) and duduk. Of course, these days the easiest option is to play a compact disc or cassette. 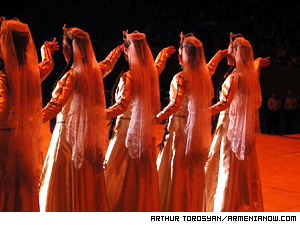 One can almost always find in the repertory of many Armenian dance groups dances like Kochari, Berd (Fortress), Suserow Par (Sword Dance), Nazani (Graceful) dances, however, each group has its own unique performance and explanation of those dances. The Berd (Fortress) is the most typical Armenian dance. Even a dance group was named after that dance. It is a victorious and courageous men's dance. During that dance, dancers stand on each others' shoulders protecting their home and native land. Berd dance can be two-story and three-story. There are numerous traditions concerning creation of that dance, but the most believable explanation was found by Srbuhi Lisitsyan. She says when Armenians were again fighting against Turks, they dug deep holes like trenches and hid there waiting for Turks. To find out whether enemies were approaching they stood on each other's shoulders, and that gave birth to the Berd dance. 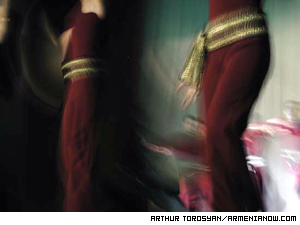 While the average Armenian party is pretty open to any form of dance expression, national dances have specific patterns to follow in group competition. Each event of daily life was marked by the dance. Even a small detail could give a birth to the new dance. Even nature had its influence. In the mountainous areas of Armenia the dance was more rugged and expressive, more masculine, while in the Ararat Valley the dance was feminine, graceful and airy. The best advice for participating is to forget your inhibitions. Then watch what somebody else does and make your own interpretation.